Salt, a highly corrosive mineral leaves its mark not only on our footwear, but also damages the natural world, metals, and building materials. In Ontario, where I currently live, winter road salt is used so heavily that the streets are white with it and there is fine white salt powder on everything. I've had too many pairs of winter boots destroyed by road salt and I'm mad as hell! In her paper, Recognizing the Corrosion Threat, metallurgical engineer, Catherine Houska, says that despite environmental concerns, salt for de-icing changes the chemistry of soil, is harmful to plants, trees, and fish, and its use continues to grow-even "sunbelt" cities now stock salt for freezing rain. The effects of salt corrosion is surprisingly far-reaching: "Seasonal de-icing salt accumulations have been documented up to 1.9 km from busy roadways and as high as the 59th floor of a high-rise building," Houska writes. Overuse of road salt in Ontario wreaks havoc on land and the crops we need to eat. In a recent legal case in Ontario, farmers sued the local government for losses on their crops due to the use of road salt and won. With any luck, this case will set a precedent and the use of corrosive de-icing salts and the destructive effects on land and vegetation will be examined and changes made, possibly moving Ontario to use a non-corrosive grit for winter traction like sand, used in places like Saskatchewan and in Russia. Salt can eat its way through even the thickest treated leathers. This winter, I watched my once-waterproof suede boots destroyed by road salt to the degree that water now seeps in and leaves my feet wet, and the salt-dried zippers don't work anymore. They look so awful that I am embarrassed to wear them, despite spraying with protective footwear products and cleaning regularly with water and vinegar to neutralize salt's corrosive effects. Now the boots are pretty much useless. So what do I do with them? Sadly, millions of salt-eaten boots and shoes have been rendered useless, and most of these will find themselves in landfills, adding to our polluted world. Though I'm not a fan of synthetics, I've decided to stop wearing leather altogether because of the animal cruelty and the environmental pollution involved in the tanning process. 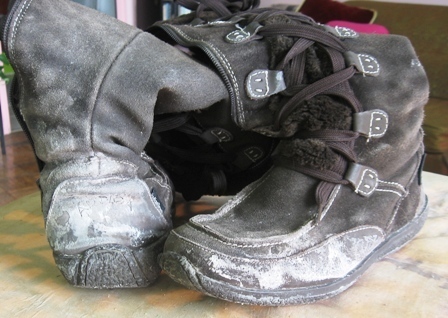 Besides that, I'm tired of having to buy new winter boots every couple of years because the salt got to them. I need a more permanent solution; boots completely waterproof and warm, boots that will repel the salt, and boots are well-made that will last. I ordered two pairs of waterproof boots online: one, a warm synthetic pair, and the second, rubber boots. I reckon that this will prevent a personal volume of winter boots from going into the landfill because the salt will not corrode these particular materials and give the boots a longer life. I've written before about the downfall of rubber boots that are now so cheaply made that they crack after one season's wear and quickly fill the dump with spent boots. I am a huge supporter of investing in good quality footwear that is environmentally responsible and that one can maintain with visits to shoe repair shops to stretch the boot's life. A Canadian company that makes good waterproof boots is Kamik. Kamik boots are recyclable and made of vulcanized rubber (the process in which rubber is heated to a high temperature which binds unstable rubber polymer chains and makes them strong, elastic, and waterproof, as opposed to cheap PVC which easily cracks and is quickly tossed). What I really like about Kamik boots is that they are serious about sustainability. They make boot liners and linings from recycled water bottles and soles are 100 per cent recyclable. Not only does Kamik use recycled products in their footwear, they also offer a recycling program on some styles: Our shoes last a really long time, but when you've worn them into the ground, keep them from getting buried in it by sending them back to us. Brilliant. In the U.S., Muck Boots does a really well-made rubber boot for city and country. Muck uses a natural rubber overlay triple reinforced in the toe and quadruple reinforced in the heel! Their website says their products are built to last (how often do we hear that anymore?) and "the rubber used to make Muck Boot brand footwear will stay flexible for years and will not cold-crack like boots and shoes made of PVC and TPR materials. (P=Plastic)." Because we never know what March has in store for us, city men could opt for a shorter boot on wet days. Kamik's Champlain and Muck Boots' Arctic Commuter are great choices for stylish men who want warm, dry feet in boots that will last and repel salt. The best alternative to disposable footwear is to choose boots made of textiles that will last longer than permeable materials like leather and cheaply-made PVC, and take them to your local shoe repair shop for repair when needed. This will keep them out of landfills and save you some money. Our saving grace would be to wear footwear that we could throw in the blue bin when we're finished with them, eliminating waste and continuously re-using the boot materials. There are beginnings of this but nothing is full-blown yet: there are shoe recycling spots (mostly in the U.S. where a staggering 300-million pairs of shoes go to landfills each year), Nike has a U.S.-based running shoe recycling program, and we're starting to see small companies develop recyclable shoes. Excellent steps forward but not fast and not far-reaching enough. Unless we want to drown in spent footwear, we must collectively take responsibility for what we put on our feet, demand sustainable products, and choose well-made footwear that will repel salt -- boots' natural enemy.